This article is a short summary of Paper Mario: Color Splash. Paper Mario: Color Splash is the fifth installment of the Paper Mario series of games, released for Wii U in October 2016. Recover the stolen colors of Prism Island! Someone or something is draining the world of its color! Who would do such a thing!? Join Huey, your trusty paint-can partner, on an all-new adventure to save Prism Island! Solve puzzles with the power of paper! Paint colorless spots to open new paths! Study your enemies before selecting yoru cards. Think about the order too. Whack 'em with your hammer! - Color in colorless spots to solve puzzles and search for clues. - Revive Toads who have been drained of their color. - Cleverly use Battle Cards during puzzling battles to defeat enemies. - Summon objects with Things cards. - Use Enemy cards to summon allies. On a stormy night, Princess Peach and Toad arrive at Mario's house with a letter. When Mario opens the letter, he finds that it is actually the folded up and colorless body of another Toad. They notice that the seal on the envelope is that of Prism Island, and immediately set off. Upon arriving at the port town square, they find that it has been ransacked and the inhabitants have also been drained of color. Soon after Mario and Peach find a 3D paint can named Huey. After meeting him, they investigate a scream and find Toad's color being drained by a Shy Guy with a straw. After they defeat it and return Toad's color to normal by turning Huey into 2D, Huey notes that the Big Paint Stars from the island's fountain have disappeared, and asks that Mario find them. Mario and Huey head around the island to reclaim the missing Big Paint Stars and stop the force that is stealing its color. Much of the gameplay appears to be similar to Paper Mario: Sticker Star. Much of the overworld gameplay revolves around Mario using his Paint Hammer to paint parts of the environment and characters to solve puzzles to advance. Battle gameplay revolves around painting special cards on the Wii U GamePad and flicking them at the screen to use. 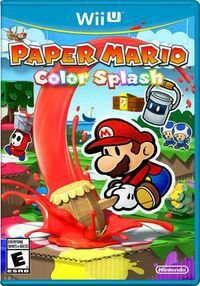 When Paper Mario: Color Splash was originally announced, the reveal trailer received negative impressions from fans of the series, who criticized the game for its similar appearance to the previous entry, Paper Mario: Sticker Star. Trailers and gameplay videos for the game received a large amount of dislikes compared to likes, and within minutes of the game's reveal, a petition on change.org was posted that called for the game to be cancelled. Upon the game's release, critical reviews were mainly positive. Most reviewers praised the game's writing and visuals, though while the battle system was noted as an improvement over the previous entry, it was still criticized for the issues it carried over. Famitsu rated the game a 35/40 (7/8/8/9). Terri Schwartz of IGN gave the game a 7.3/10, claiming that, "The beautiful Wii U graphics and playful humor stay true to the spirit of the Paper Mario franchise, but the story is straightforward and a bit bland," and overall calling it "a strong step in the right direction." In Japan, Paper Mario: Color Splash sold 20,894 copies on the week of its release, placing third in overall sales that week. Due to an unspecified error, when Paper Mario: Color Splash was put up for pre-load on the Nintendo eShop, the pre-load data gave players access to the full game, two weeks ahead of the actual release date. The pre-load option was removed soon afterward. ↑ Paper Mario: Color Splash coming to Wii U October 7th. Nintendo Inquirer (June 14, 2016). Retrieved June 14, 2016. ↑ Nintendo 3DS Direct 2016.9.1 プレゼンテーション映像. Nintendo 公式チャンネル (YouTube; September 1, 2016). Retrieved September 1, 2016. ↑ 3.0 3.1 Famitsu Review Scores: Issue 1454. Gematsu (October 11, 2016). Retrieved March 26, 2017. ↑ Paper Mario: Color Splash draws ire of Nintendo fans, looks alright. Destructoid (June 18, 2016). Retrieved March 26, 2017. ↑ Paper Mario: Color Splash has been around 30 minutes and people already hate it. TechRadar (March 4, 2016). Retrieved March 26, 2017. ↑ Media Create Sales: 10/10/16 – 10/16/16. Gematsu (October 19, 2016). Retrieved March 26, 2017. ↑ Paper Mario: Color Splash pre-load accidentally lets Wii U owners play the entire game early. This page was last edited on 26 March 2017, at 18:41.